Our 3nd annual TAPS Project was a success. 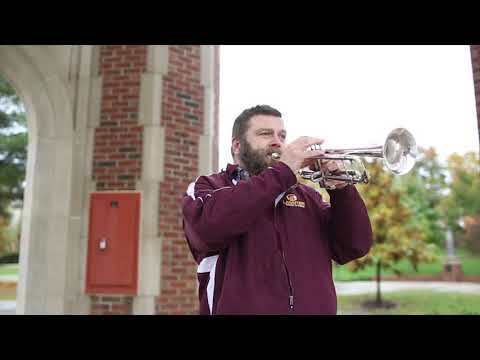 Trumpeters from the area performed "Taps" in sequence on campus in honor of Veterans' Day. It was an incredibly moving event for all involved and for all who listened. Participants spanned many generations. All events are in the Roland Hayes Concert Hall at 7:30PM unless otherwise noted. Details are at www.utc.edu/music. Dr. Erika L. Schafer is in her eleventh year as Professor of Trumpet and Assistant Director of Bands at UTC. She teaches trumpet lessons, directs the Jazz Band, is the Assistant Director of the Marching Band and Pep Band, and teaches Brass Methods. She performs with the Chattanooga Symphony, and has visited Chile to present master classes at the University of Chile and Catholic University of Chile. She initiated the Chile Skype Project at UTC, an international virtual trumpet studio class. She has been a guest artist and performed recitals at Kansas State University, The University of Arizona, and Eastern Illinois University. Dr. Schafer is a member of the cutting-edge Fuze Trio (including Ronda Ford, flute, and Jenny Parker, piano), whose repertoire includes world premieres and other modern compositions as well as arrangements of traditional classical music and popular music. She was the host of the 2014 Trumpet Festival of the Southeast which featured guest artists Allan Dean and Tito Carrillo. Other guest artists she has hosted have included Douglas Hedwig, retired trumpeter from the Metropolitan Opera Orchestra, Anthony Plog, composer of solo trumpet and brass chamber music, and Thomas Hooten, principal trumpet of the L.A. Philharmonic. Jazz artists she has hosted include Jeff Coffin, saxophonist with Bela Fleck and the Flecktones, and his group Mu’tet, and the U.S. Army Jazz Ambassadors. Prior to her position at UTC, Dr. Schafer was a member of the United States Navy Band in Washington, D.C. where she was a featured soloist and performed with several chamber ensembles including the U.S. Navy Band Brass Quartet and the Joint Services Brass Quintet. She was also active in several orchestras in the D.C. area including the McLean Symphony Orchestra, the Fairfax Symphony Orchestra, the Folger Consort, and the Orchestra of the 17th Century. She is a former student of the Aspen Music Festival and School. Her primary teachers include Walter Chesnut, Allan Dean, Chris Gekker, Steven Hendrickson, and Louis Ranger.